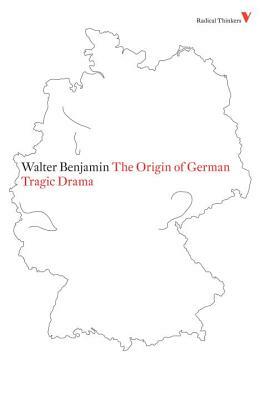 Cited by Lukács as a principal source of literary modernism, Walter Benjamin’s study of the baroque stage-form called Trauerspiel (literally, “mourning play”) is the most complete document of his prismatic literary and philosophical practice. Engaging with sixteenth- and seventeenth-century German playwrights as well as the plays of Shakespeare and Calderón and the engravings of Dürer, Benjamin attempts to show how the historically charged forms of the Trauerspiel broke free of tragedy’s mythological timelessness. From its philosophical prologue, which offers a rare account of Benjamin’s early aesthetics, to its mind-wrenching meditation on allegory, The Origin of German Tragic Drama sparkles with early insights and the seeds of Benjamin’s later thought. Walter Benjamin was a German-Jewish Marxist literary critic, essayist, translator, and philosopher. He was at times associated with the Frankfurt School of critical theory and is the author of Illuminations, The Arcades Project, and The Origin of German Tragic Drama. George Steiner, author of dozens of books (The Death of Tragedy, After Babel, Heidegger, In Bluebeard’s Castle, My Unwritten Books, George Steiner at the New Yorker), is Extraordinary Fellow of Churchill College at Cambridge University.